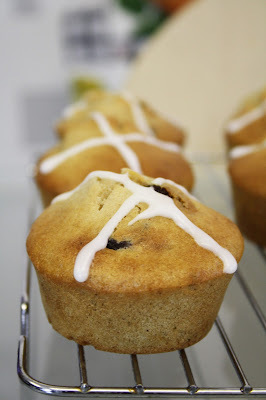 Gluten free hot cross muffins. Inspired by the traditional Easter treat, these yummy muffins have all the tasty elements of a Hot cross bun without any of the gluten! Sure, you can't beat a yummy toasted Hot cross bun, but why have just that when you could also be tucking into a batch of these delicious muffins! These muffins take on all the flavours of the traditional treat with a few tweaks along the way, everyone has a different take on the traditional recipe, and these muffins take a few of those much loved ingredients and surround them in a lovely fluffy gluten free muffin, yes that's right.. a fluffy gluten free muffin, you haven't read that wrong. 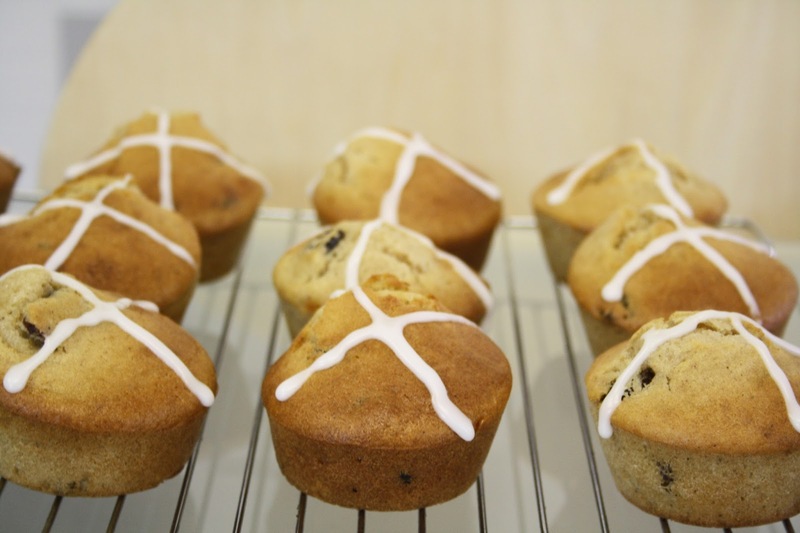 Whilst some may prefer the traditional Hot cross bun, you'll definitely want to help yourself to more with this yummy recipe. Swapping the usual recipe for mixed fruit with plump sultanas and surrounding them with tasty spices to bring in all the usual flavours for one scrumptious bake! Pre heat your oven to 170c/150c fan/gas mark 3 and grease a muffin tin. If you're using muffin cases fill the tray with the cases, I used a silicone tray for mine so opted not to use any cases for my muffins. Either will work perfectly. In a large bowl sift together the gluten free flour, cornflower, xanthan gum, baking powder, bicarbonate of soda, salt, cinnamon and mixed spice and mix together to blend. Then add in the sultanas and mix well, these will add a tasty twist to the traditional Hot cross bun recipe. Stir well to mix, then set aside. In a separate bowl, cream together the stork and sugar till pale and fluffy - using stork or dairy free margarine instead of butter helps to make this bake lactose free as well as being gluten free! Add in the eggs one at a time and mix. Finally add in the vanilla extract and lemon juice and mix. Add the flour mixture to the stork mixture, adding it a bit a time to mix, alternating it with a little of the lactose free milk. This will form a lovely tasty batter to make your muffins. Once you've mixed in the flour and the milk, spoon your muffin batter into the muffin tin holes, filling each around 2/3 full. 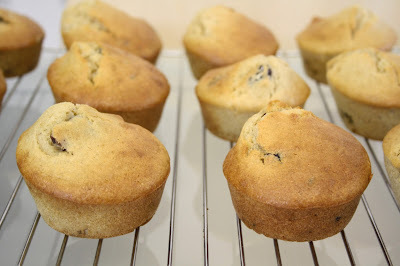 Place in the oven and bake for 20 minutes till risen and golden, then remove the tray from the oven and let the muffins cool in the tin for 5 minutes, before placing them on a wire rack to cool down. Once the muffins have cooled, mix the icing to pipe your crosses on top, this completes the tasty look of the Hot cross bun in muffin form! Sift the icing sugar into a bowl and add in 2 tsp of the milk, then stir in to mix, the icing should start forming a stiff lump at this stage. Add another tsp of milk to loosen this mixture and stir well. Spoon the icing into a piping bag with a small round nozzle, then pipe crosses on top of each muffin to finish. 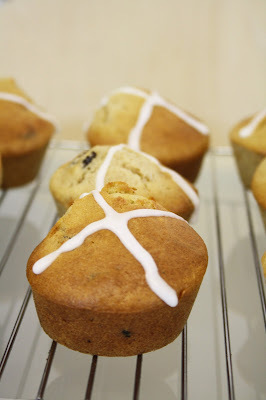 The end result is a yummy Easter treat, with all the flavour of a Hot cross bun, but with a tasty muffin-y twist! These should last well when kept in an airtight container for a few days, that is if you don't eat them all at once! Recipe adapted from: Gluten-Free on a Shoestring. Who wouldn't want to be able to order some tasty cake with a mere click? That's just what new marketplace, Top Bake aims to do, filling a yummy gap in the market with some tasty cakes from a selection of bakers around the country! That's certainly one way to tempt your sweet tooth! Why spend countless hours trawling the internet looking for the perfect cake, when you could find it within minutes. With Top Bake you'll have a selection of bakers at your disposal to create the perfect bake, whatever takes your fancy, and whatever your needs are. It's safe to say that we all love our cake, whether it's a yummy batch of cupcakes for a get together, or the perfect cake for that special occasion, and with their handy marketplace you'll be able to find those tasty bakes with ease. 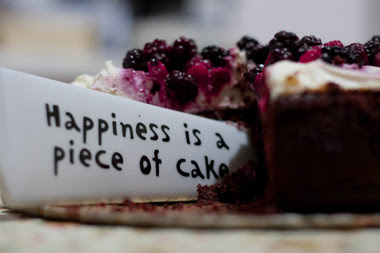 Whether your after a traditional bake, something that's free from friendly, or deliciously filling, you'll be able to find a yummy selection of cakes to order. As someone who can't eat dairy or gluten this is great news, being able to order a scrumptious gluten free cake with a simple click is just fantastic, and a great time saver too, no more countless hours spent scrolling through search results to find a local free from baker! 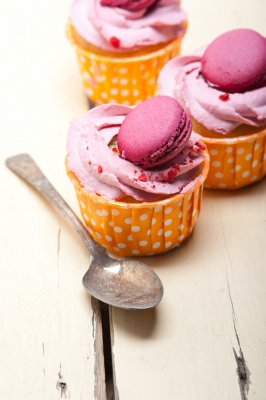 But it's not just a chance to shop for the perfect bake, it's also a great way to reach new customers for any bakers. With Top Bake on the lookout for bakers to sell their scrumptious creations on the marketplace, you'll soon be selling your tasty bakes in no time! Due to launch in early May, you'll soon be able to find that perfect bake with a simple click, making it quite literally a piece of cake! Whether you want to get involved as a baker, or take a peek at their latest selection of tasty bakes, you'll be able to find out more at www.topbake.co.uk. Keep on top of the latest scrumptious offerings before they launch on Facebook, as well as Twitter & Instagram. Images: Creativecommonsstockphotos/Dreamstime Stock Photos & KEKO64/FreeDigitalPhotos.net. 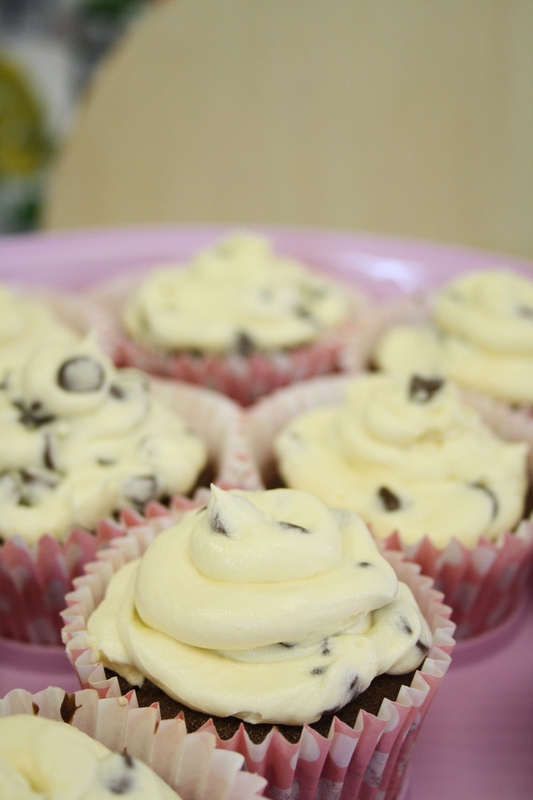 A deliciously chocolatey treat, inspired by the classic ice cream flavour and turned into a scrumptiously moreish cupcake! 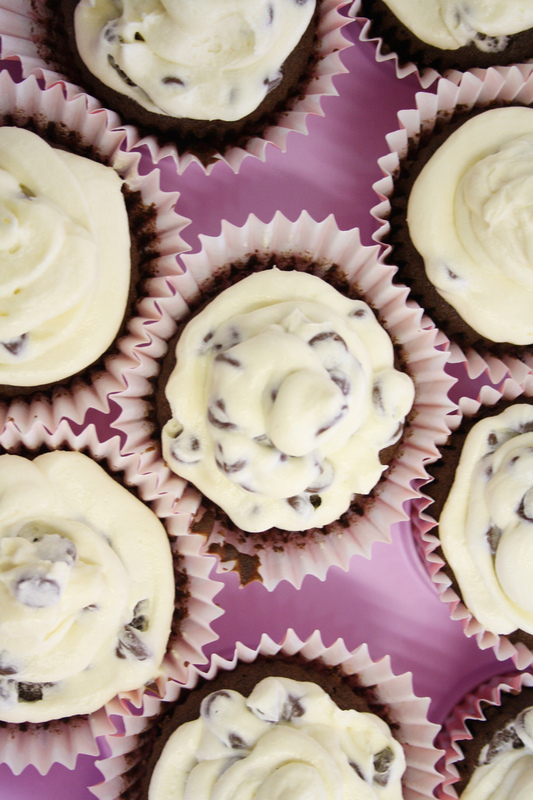 With an extra helping of chocolate chips both inside the cupcake and in the frosting, these tasty bakes won't last long at all! After months of gluten free baking this was a bit of a change for me, baking some regular cupcakes for friends and family to over indulge on. It's good to know that I can still bake a tasty cupcake just as much as my free from treats, even if I can't eat them myself. These are a great recipe for any chocoholics, and make a change from plain ol' chocolate cupcakes. Ingredients (makes a dozen cupcakes). Sift in the flour and the cocoa powder and mix until fully combined, scraping the sides of the bowl to ensure it's fully mixed in. Add the milk to loosen the mixture, if you prefer a really moist chocolatey bake you may want to add a further 2-3 tbsp of milk to the mix. Then stir in gently to blend. 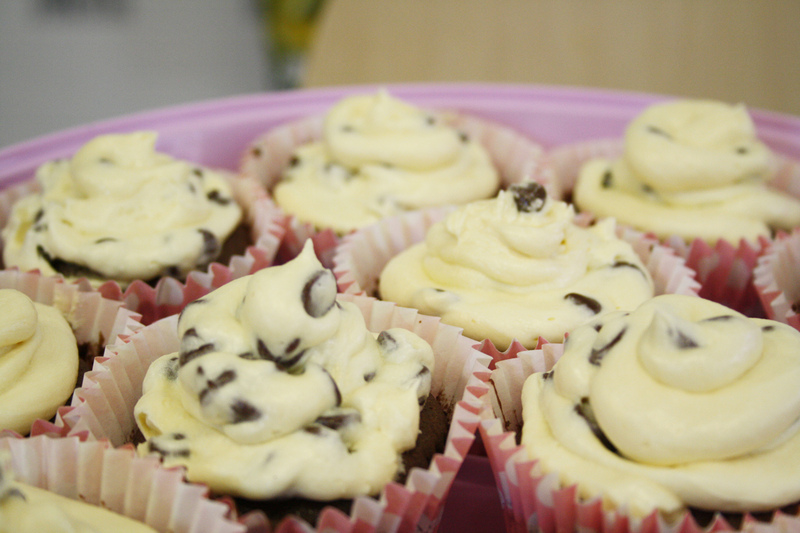 Finally, add those chocolate chips into the mix, they can be any flavour you prefer – dark, white or milk chocolate! I used milk chocolate for mine as a treat and a change for my friends and family more used to my lactose free baking! Stir the chocolate chips in to mix, then spoon your chocolatey mixture into the cases, filling each around 2/3 full. Bake for 20-25 minutes till risen, then set aside to cool on a wire rack. 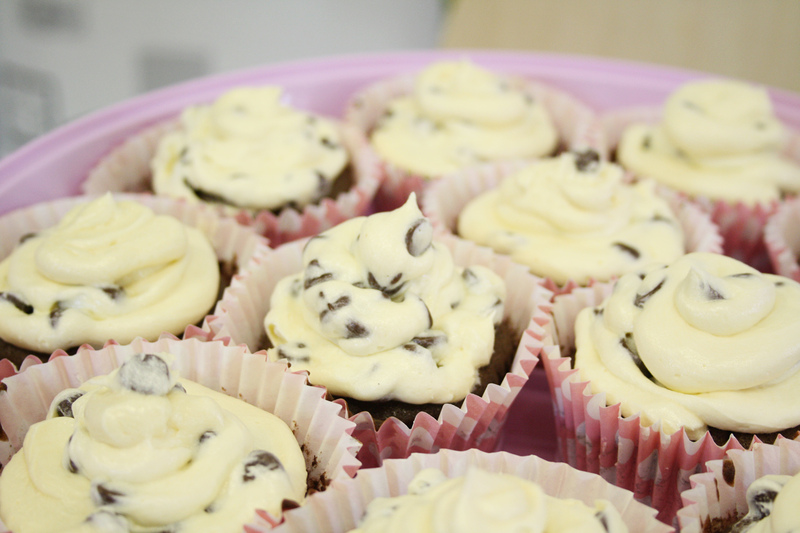 Whilst the cakes cool you'll want to mix the tasty frosting. Whisk together the butter with half of the icing sugar (150g) until fully combined, this will take a couple of minutes. Sift in the remaining icing sugar and whisk again till fully combined. Add the vanilla extract to the frosting, this will give the cupcakes a tasty mix of flavours with the chocolate and vanilla giving it a scrumptious taste. Whisk for 2-3 minutes till combined, this will also lighten the frosting giving it that paler vanilla tone. 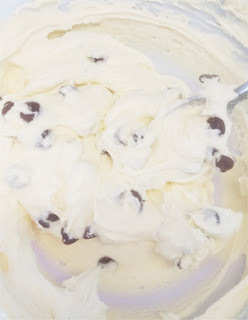 Add the chocolate chips to the frosting and stir in to mix, this will add that tasty chocolate chip ice cream look to your topping. Spoon the frosting into a piping bag without a nozzle and snip off the end of the bag to pipe - you'll want to allow a generous sized opening so the chocolate chips can pipe easily, snip around 2" from the base of the tip for a decent sized opening. Pipe the frosting on top of each cupcake, don't worry if it's not completely perfect swirls, as long as you have a generous amount on top of each cake!! These cupcakes are perfect for anyone fond of chocolatey treats, they make for a tasty change from plain cupcake recipes and they'll definitely go down a treat. Now I just need to make a gluten & dairy free version for myself!! NB: It should really go without saying, but if like me you are gluten intolerant, or coeliac please do take care if you do decide to make these for your non gluten intolerant friends! Take the time to clean up throughout the process (I can't tell you how much I washed my hands whilst baking and still managed to make myself ill afterwards!! ), and ensure that your kitchen is contaminant free afterwards.